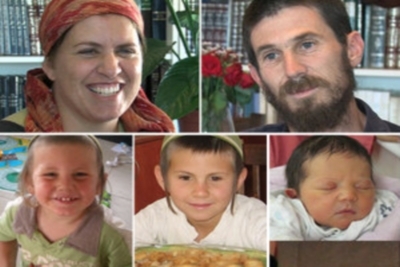 The recent massacre of the Fogel family in Itamar was sickening. What else is there is say? Too much, apparently. It is deeply saddening to read how this incident is being bandied about for political gain – whether it’s a reported Hamas reference to the attack as a “heroic operation” or the Israeli government’s cynical approval of 500 housing units as a “price tag” for this tragedy. Rabbis For Human Rights strongly condemns the terrible murders in Itamar. They were of course a violation of the most basic human right, the right to life. We send our condolences to the family. This entry was posted in Human Rights, Israel, Palestine, Politics on March 13, 2011 by Rabbi Brant Rosen. Brant – That says it all. I totally agree with you, and was very saddened by this event and by the political aftermath it will (has already) engender. I completely agree–sickening is the perfect word. Also sickening has been the response by the army and settlers here. In addition to the 500 new settlements, there is a wave of violence against Palestinians here from settlers, the essential shut down of a village outside of Nablus, and the the rounding up of young Palestinian men by the army. Yes to everything you’ve said. I’m still trying to figure out how to write about this. If what you are saying is that the deceptive swill spewed relentlessly by Itamar Marcus and his ilk is sickening, then I would agree with you. But wait! There’s more! We could add this as sickening (http://972mag.com/unbelievable-racism-hate-talk-from-prime-minister-sharons-son/) and I’m sure that five minutes on line will dig up more. The question isn’t whether this or that murder, or this or that piece of vicious rhetoric, is sickening. The anti-slavery raids in Bloody Kansas were pretty sickening; abolition was still right. Etc. Fill in your own favorite analogy, from whatever cause you like best. But let’s not kid ourselves that this has much political meaning, really, one way or the other. I can’t do better than the statement by Rabbis for Human Rights, so I will simply echo it. Whoever committed this crime can not be human! Detractors will try and reason Black September, aircraft hijackings, suicide bombing and rocket/mortar attacks is the norm of Palestinian resistance. However, this is not the case. What grabs the headlines and what feeds xenophobic propaganda are examples of violent resistance (and more so terrorist attacks). If there is to be healing between the people of Palestine and Israel we need to move on from such one-eyed statements. How many Palestinian babies and children have been killed through Israeli state actions? How much money are Israeli soldiers (from the lowest ranks to the top) paid and rewarded for their use of violence against another people. How much are Israeli politicians paid to perpetuate the occupation and expansion of a Israeli territory through settlements? Who mourned for the loss of life of Muhammad Mamun abu-Sara, aged 1 year of al-Issawiya village near Jerusalem, died at Hadasa hospital in Jerusalem from tear gas inhalation during daily IDF incursions into al-Issawiya from September 22-25 2010. Who mourned the death of Hamza Samar Muhanna abu-Maria, 7 months, of Beit Omar, Near Hebron, died of IDF tear gas inhalation May 7 2010 while in her home during a demonstration. What about Dima Said Ahmad al-Zahal, 5, of Beit Lahya, Gaza, died of wounds sustained Jan. 7 2009 during an IDF attack on Beit Lahya. Jordan, I am confused by your greeting of ‘shalom’ and signing off of ‘wholeness’. When I think of shalom I think of the interconnectiveness between Palestinian, Jewish-Israeli and Palestinian-Israeli people. I think of our shared humanity, of our mutual failure to understand fellow human beings. I think of the failure of each of the major religions to truly live out salam, shalom, peace and joy. And the tendency for the mainstream to use religion to divide and exclude rather than unite. I hope your use of shalom and wholeness acknowledges the failings of us as a people to get things right and the need for us to humbly seek for a new way we can live for the benefit of another. Jordan, it would be encouraging if you were to identify examples of failings of the state of Israel in its actions over the past 43 years in continuing this occupation. I await a glimpse of hope that indeed the shalom and wholeness you speak of is open to your Palestinian brothers and sisters who continue to live under military rule. Really, enough. I agree with the Rabbi and Rabbis for Human Rights. Israel, deaths in such circumstances will be used for political gain on whatever side. Neither you or I know the killer(s) of this family. The truth will be obscured by political opportunists (again on both sides). I as one individual can condemn such a killing. You may choose to look at my comments in a cynical way. That is your choice. My statement reflected the unavoidable context that this death occurred within. In no way does it justify or condone the killings.